Lee Grieveson. 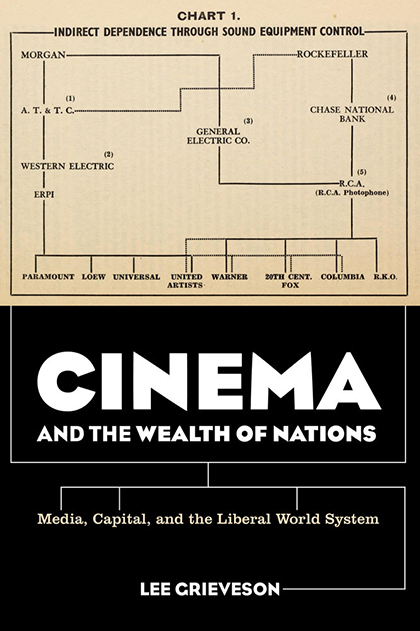 Cinema and the Wealth of Nations: Media, Capital and the Liberal World System. Oakland, Calif.: University of California Press, 2018. 492 pp. Historical scholarship on media has rarely been this relevant. Grieveson’s magisterial account of the interwar period reveals the inner workings of a massive liberal political economic machinery motored by US industries and governmental organizations that designed and conscripted media to serve corporate interests. Our contemporary moment offers too many testimonials to the success of this enterprise. In 2018, Andrew Smith has been appointed director of the Federal Trade Commission (FTC) Bureau of Consumer Protection, after a lucrative career as corporate lobbyist and legal counsel to over fifty companies, including AMG Payday Lenders, Facebook, Uber, Wells Fargo and Equifax. While on their payroll, Smith reduced corporate oversight, promoted deregulation, and rolled back consumer rights. How has this come to pass? To grasp how thoroughly corporate capitalism defines the terms of US democracy today, Grieveson demands that we turn our attention back to the interwar period, specifically to a slice of time between the 1915 Panama–Pacific International Exposition in California, which inaugurated global trade between the Atlantic and the Pacific, and the 1939 World’s Fair in New York, which heralded industry and technology as consumable visual spectacles. Grieveson brings together vast archives of material on state and corporate media rarely discussed in film studies to present a riveting exposé of how US media infrastructures were shaped by radio and film’s function as profit-generating commodities that doubled as “display mechanism[s] for other commodities”; in Will Hays’s words, they were “‘animated catalogue[s]’” (p. 273). This made film and media uniquely valuable to powerful interests invested in enlisting a potentially democratic public sphere to peddle US free market enterprise and, concomitantly, to secure US state power. In this book, hoary histories of the vertical integration of Hollywood studios, the Paramount antitrust case, and studio divestitures are narrated afresh as landmark instances in the expansion and consolidation of corporate capital over US democratic institutions, liberal polity, and culture. Irrefutable details accompany these retellings. Foundational media policies (such as the 1927 Radio Act) and the practices of powerful organizations (such as the USDA’s use of cinema in developing agricultural practices) reveal that media were founded and deployed repeatedly to consolidate the modern US state as a largely corporate, and often a militantly corporate, enterprise. Grieveson is a very deft storyteller, and he constructs a grand narrative of capital and media with many moving parts—these range from the work of elite banks such as the House of Morgan and Kuhn, Loeb; the defense of intellectual property that protected corporations and suppressed innovation; the films and trade practices of companies such as Ford, General Electric, and General Motors—without losing sight of the big picture. The book’s argument is that media’s role in consolidating an Adam Smith brand of free market liberalism dedicated to scaling back the state—“‘more business in government and less government in business,’” as the maxim attributed to Hays went—debilitated alternative conceptualizations of liberalism and media, even as it culturally preconditioned the populace to accept corporate liberalism as democracy (p. 268). The contributions of this book are manifold. It is, of course, part of a growing body of work on corporate film and media, a new and compelling area in media studies. But its more significant legacy will be that it expands the definition of corporate media to media infrastructures supporting corporate liberalism, which effectively covers most forms of media today including much of what we categorize as commercial entertainment films and educational films. In film studies, there will be those who are skeptical of this argument, particularly scholars invested in resistant audience reception and against-the-grain textual analysis. They will nevertheless have to answer the profound challenge that Grieveson’s careful history and audacious theorization of liberalism poses to entrenched disciplinary habits in film studies. This book asks if we risk too much, and indeed risk making our discipline irrelevant, if we fail to see cinema and mass media’s centrality in laying the groundwork for an aggressive free-market liberalism defined at a macro level by the convergence of US state and corporate agendas that shaped and continue to define Western democracies, Western media, and their globalizing empires. Although there have been other excellent institutional analyses of media, none has hitherto gone as far as this book in exposing the inner mechanics of media’s role in forming the liberal world system and its “ostensible public sphere” (p. 28). For that reason, this is a paradigm-shifting book of film and media history. It should be essential reading for all historians and political economists, and it may find a crossover readership outside academe. When the word ostensible slides in before “public sphere,” it slays with a sense of betrayal the hope that things might have been otherwise. The hope for a genuine commons is explicit in the book’s last chapter, but it is also manifest in the author’s lucidity and humor throughout this impressive volume. One of the most enjoyable things about Grieveson’s book on “the sumptuous shaping of electrical light bent toward the spectacular fetishism of commodities” is its beautiful writing (p. 357). Vivid metaphors for dry economic ideas and a light touch in presenting convoluted chains of events make it easy to read and process despite the book’s length and the heavy burden of its argument. The empty jargon and catchphrases of bankers and corporations are turned against them—chapter titles use plays on word (“Highways of Empire,” “League of Corporations,” “Silver Chains of Mimesis,” “The Golden Harvest of the Silver Screen”) that, it becomes clear, are also substantial subversive arguments—as Grieveson gifts his readers a vivid grasp of the invisible and complex workings of power via media under liberalism. After reading the book, such comprehension feels like a kind of empowerment, and perhaps that is how this author chooses to give expression to resistance. When Grieveson concludes with a note of agenda setting, making the case that “imperatives to study power and foster progressive transformation ought to be central to the disciplines that explore media,” perhaps that is what he means (p. 335). Media histories must recommit to their mission of explicating the politicoeconomic​ terms by which our world is constituted. This book does so resoundingly well.